Enhance Your Skills. Energize Your Career. WSU’s Master of Science in Agriculture (MSAG) program, offered entirely online, is designed for agricultural professionals, practitioners, and educators who wish to gain knowledge and skills and boost their careers. The program’s flexible, fully-online format is ideal for working professionals who want to achieve their academic and career goals with continuing with their careers. 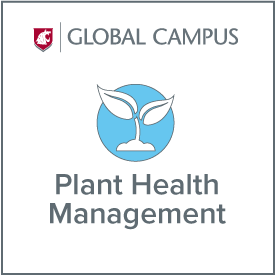 The MSAG Plant Health and Management option combines WSU’s world-renowned plant science graduate programs with business courses in executive management. The plant health and management option provides students with a solid core curriculum in agricultural science focusing on valuable practical knowledge and skills for agricultural professionals. You will also take course specializing in plant health, business and management. This combination of science and business courses means that graduates will be uniquely qualified to meet the increasing demand for managers who understand science and research as well as business and industry economics. Courses include entomology, plant pathology, crop and soil science, along with training in economics and organizational management. Upon graduating, you will be fully qualified to manage commercial‐scale agricultural or horticultural operations, including farms, greenhouses, landscapes and parks. You will also be able to diagnose and address problems associated with plant pathogens, insects and weeds, as well as environmental factors, including soil, that impact plant health. WSU has a rich history of excellence in agricultural education. Our scientists and graduates have literally changed the world by improving the food supply. Regional students can augment their education with face-to-face learning at WSU four research centers, and network with allied area employers. WSU’s renowned agriculture faculty members have a wealth of professional experience and technical knowledge ready to pass on to you. They are passionate about engaging with online students and providing them with an educational experience tailored for the fully-online format. Application requirements include a bachelor’s degree in a related area, such as agriculture, biology, entomology or plant pathology, with a 3.0 or better GPA. No GRE is required. Access the admission application on the WSU Graduate School Admissions webpage. Please be advised that the graduate school application deadlines may differ from those for this degree. If you have questions about the degree, please contact Lisa Lujan at llujan@wsu.edu or 509-335-9542. With prior approval of Program Director, other applicable management courses may be considered. AGRI 702, Master’s Special Problems, Directed Study, and/or Examination. A minimum of four credits are required; you must be enrolled in 2 credits of 702 in the term of your final exam. Project and examination requirements are explained in detail in the MSAG Student Handbook.